Youth ministry faces a lot of issues today. The leaders often feel undervalued, students are under constant pressure, and the ministry itself is sometimes misunderstood as it searches for direction. What’s going on youth ministries today? How do we need to change? What kind of direction do we need to take? That’s what I asked many youth ministry bloggers in hopes of compiling a resource that generates discussion and evaluation of our own ministries as we seek to be as effective as possible in reaching this generation. Jason Curlee (Youth Pastor) of Making difference makers. Heidi Abbott (Youth Pastor) of Church of the Harvest. Dot Gosling (Senior Lecturer of Christian Youth Work & Applied Theology) of dot gosling. James Tippins (Associate Pastor) of Being Wise and More Stupid. 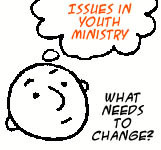 I’ll conclude the series with my own summary of the top 10 issues in youth ministry based upon the content of these authors, feedback from you guys and the survey running in the right side-column, so your input and discussion is very much requested and appreciated. If you’d like to write an entry as a part of this series, please feel free to contact me.